After a long time with Sony Ericsson phones (K750i, K550i, G705i) and overall disappointed with the last one, I decided to return to Samsung (my last one in 2004 was the SGH-E700) by acquiring the Galaxy Lite/GT-I5700/Spica/Portal. 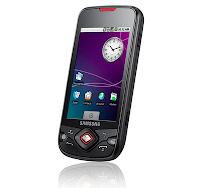 I'm a Google fan since the early hours so it was obvious that I'd come sooner than later to an Android phone. For a fact, I new that I wouldn't return to a Windows Mobile phone after the HTC TyTNII "Kaiser" (the blame goes mostly to WM, altough I still have the display drivers scandal in mind). So after looking at the HTC Hero as a potential candidate, I spotted the newer Spica with similar specs and better price. I almost bought the Galaxy I7500 by accident, since I couldn't tell the difference between these two phones both priced around ~€220. 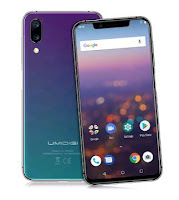 While the I7500 has an AMOLED screen and more internal memory, the Spica, with its traditional LCD screen, comes with a faster CPU (800Mhz) and, last but not least, the promise an upgrade to Android 2.1 "éclair", something that I7500 owners are still screaming for. Why not an iPhone ? After a too long wait, the phone arrived from a German eBayer. The Spica packaging is minimalistic but complete: 1 CD, 1 manual, 1 usb cable, 1 earphones and 1 microSD card of 1GB. This parameter has a toggling relationship with the other parameter in Settings > Application settings > Development > USB Debugging. All this to find out that neither PC Studio or its redundant counterpart, Samsung Kies, would support the Android phones except for updating the firmware. The second newbie challenge was to access the MicroSD memory from Windows. A drive was created on Windows but would not open. 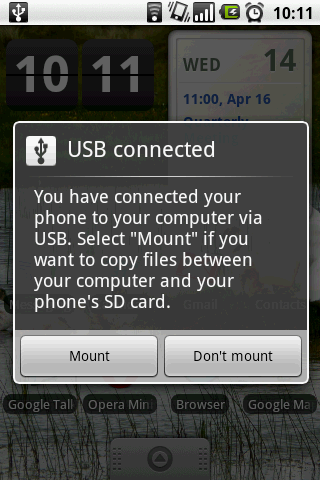 To solve this, the drive must actually be "mounted" by going to the notification area, tap on "USB connected" indication, and select the "Mount" option. Simple...once you know it. Then the fun really started, and I must say it's a very enjoyable experience to use a phone on Android platform. 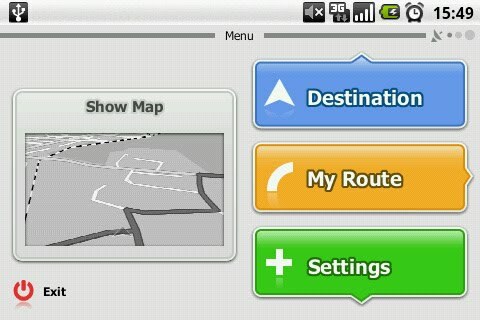 Despite its the rather old 1.5 version of Android, the system is stable and well thought. 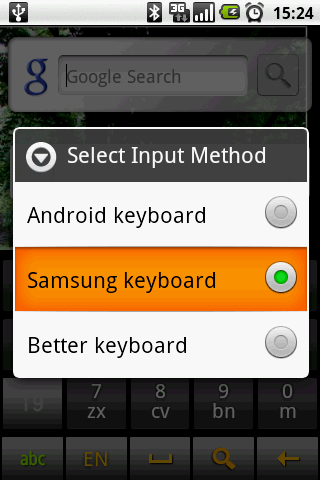 The classic Android keyboard, with rather small keys can be here replaced by a more clever Samsung keyboard . Switching to another keyboard once again requires to know another hidden trick since there is menu setting for that. The method consist in opening the keyboard first, by going into Google search for instance, and have a long press on the left lower key labelled "?123". A pop-up window appears with "Input Method", which is where you choose the keyboard model to activate. The Samsung keyboard offers 20keys, 12keys, and Qwerty layouts, with multitap and T9 using larger keys. There's also a language key allowing to quickly swap from a language to another. This seems at first better than the Android keyboard, but there are some problems, especially of typing in another language than English: some punctuations and accents are not as easily reachable that with the Android keyboard (where a long press is all it takes). Here you need to hit the "abc" key and swap to another input mode (Abc, Numeric, Symbols). This slows down significantly the typing speed potential of the layout. Also, an irritating bug affecting all the languages, where the "i" key always produces an Uppercase I... not good for case-sensitive passwords! I remember that, for my older Windows Mobile phone, it took me some time to gather all the apps needed to fill the gaps, and I had to pay for most of them. Here, I found all the essential and plus for free the first day. Since Google does not yet allows pay-apps in some countries like Ireland, freeware and trial versions are all you get on the Market. Google Sky Map: gives you to the names of stars just by point the phone to them. KeePassDroid: the Android client of the password manager KeePass. Antennas: helps you locating nearby GSM antennas. Can come handy when you need to point a 3G booster antenna in the right direction. ES File Explorer and ES Task Manager: always useful at times and a task manager is sometimes needed to clean up the memory from sleeping programs. Astro (File manager and tools): same as above, both are equally good. Twonky Server: Allows you to share media content from the phone with most UPnP and DLNA devices. WebSharing Lite: a good way to make the files on your phone available to PC's through Wi-Fi. Wallpaper Rotator: set a directory with your favorite pictures and they'll be used as background pictures at define interval. Wifi Analyzer: collects statistics on the surrounding Wi-Fi channels in use. WeatherBug: a quite complete weather forecast application. FPT System Manager: Allows to monitor the phone memory and CPU and gives fast access to some settings like Brightness, ringer, media and incall volumes, including switches for GPS, Wifi, BT and GSM. 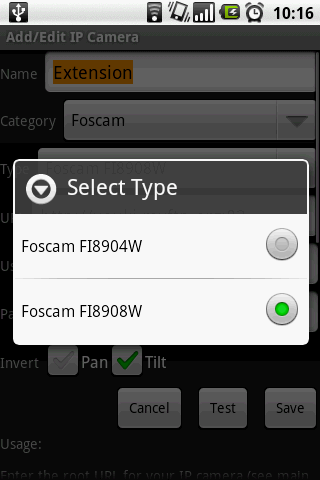 Amongst the good surprises, I found a little gem called "IP Cam Viewer Lite" that has support for my Foscam IP cameras with PTZ control! Compared to the J2ME IP Camera Viewer I was using on my Sony Ericsson G705, the user interface is better and it can save snapshots. The excellent IGO navigation, based on the latest Amigo UI, is also available for Android. A little regret also that the 3.5mpix auto-focus camera is not more snappy. The current camera software is also very minimalistic. Like all the Spica owner's in Ireland, I'm waiting for the arrival of the Android 2.1 "éclair" and it seems to be up to the O2 operator and Samsung to release it anytime soon. At time of writing O2 says they're testing the release for approval. Wow, a really nice quick review of the Device and Apps. The explanation about mounting the SD Card was very useful as was stuck as I was having the same problem as urs- the drive could not be accessed. I have a problem. I bought mine 2nd handed and had to unlock it so i can use my carrier. but i CAN'T find, better, there's NO, additional settings. any idea ? how can i fix it? i believe it happened when i sent it to unlock. 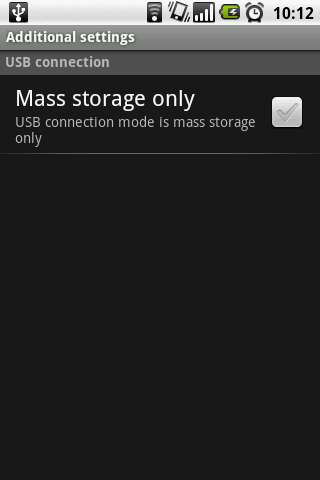 What do you mean by no additional settings ? 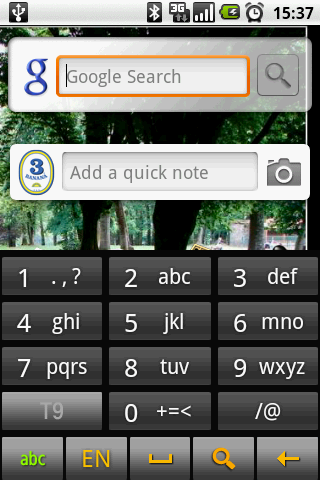 Do you know its android version ? With the proper procedure, it's not too difficult to re-flash it yourself. Settings -> About the Phone -> Additional Settings(or User Settings, dunno). aw.. tnks. I'll take a look. at that time my phone was in v.1.5. With 2.1 and over you don't need to do that anymore, just hit "Mount" in the "USB Connected" that appears in the notification area.